I think that New Mexico is my favorite state. I love the geography, the weather and the vibe. It’s a strange dance between the people of the Nations, the casinos, the wealthy, the tourists and the spiritual folk. I’m still keeping Lake Pleasant on my To Do list because it’s an easy peasy drive from there to L.A. where Dotter and family are. I stayed in Gallup, NM. Gallup is a beautiful place. It’s in the middle of spectacular red rock formations. The flip side is that it’s very poor. I was approached three times for money or food. Even though there was a big ceremonial and there’s clearly a strong tourist trade, that doesn’t seem to translate into support for the people of the Nations. After a crazy night, I hit the road at 6:30 a.m.. Also, Yelp saved me again! I found a fabulous coffee hut….The Blunt Brothers Coffee House. 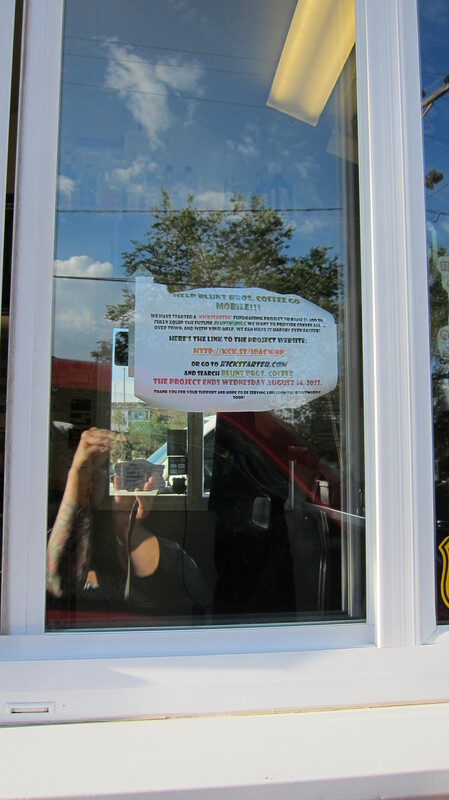 Tee hee… Blunt Brothers Coffee is running a Kickstarter campaign to fully outfit their shop. I’m not saying that you should support them, but having been on the road for 13 days, I can tell you there is a shortage of good espresso out there! I enjoyed a yummy large Chai Latte with a double shot. Just what the author needed! If you’re in the area, Blunt Brothers is on Historic Route 66 and if you’d like to support a small business…$ 5.oo or $10.00 dollars on Kickstarter wouldn’t hurt. It was a three and a half hour drive to Espanola….a drop in the hat, a toss of the bucket? 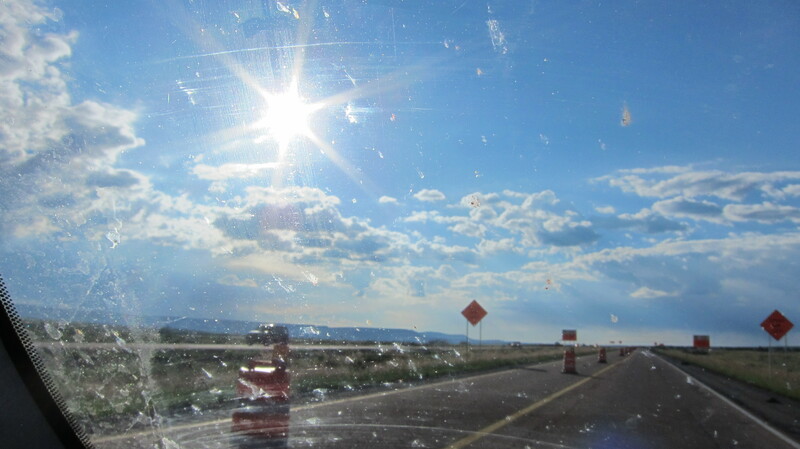 Oh…you know what I mean, a relaxing drive through the distinctive New Mexico landscape. It was hard not to take every picture I wanted to. It was also strange to follow a rainstorm east. Usually I’m on the other side of those storms. 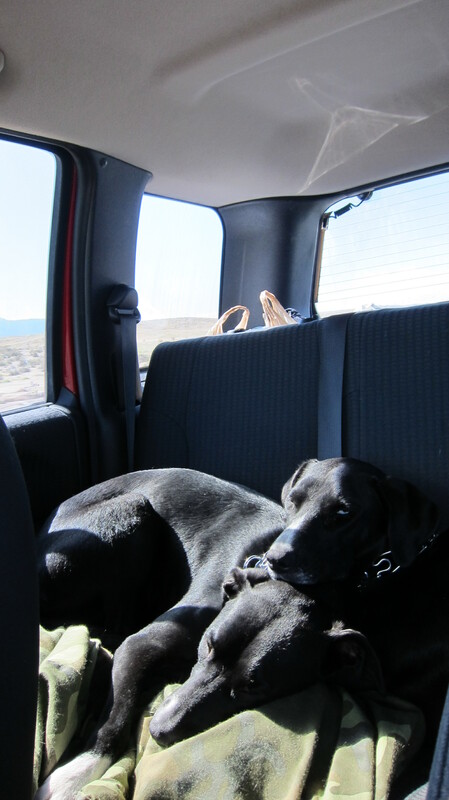 The dogs seemed resigned to the Jeep….again. I did pull the big, blue bean bag into the back of the Jeep, offering them more room. It didn’t impress them. I arrived at my cousin Mary Jane’s in Espanola around noon. MJ is one of my favorite people….I’ve been so fortunate to have seen so many of my favorite folks on this trip….she came to live with us when I was a preteen and she was thrilling. MJ is bold, brassy and fearless. She cuts to the heart of things. MJ also makes jewelry. My gorgeous matriarch ring. The mother/dotter rings and most recently my thumb ring. Her house is an artistic vision and a joy to be in. The dogs are at tense impasse with my cousin’s dogs. Oona just deliberately peed on Sophie’s bed….passive aggressive much? She’s never done anything like that before. It’s time to get home I think. Santa Fe is an artist’s haven and I’m looking forward to a brief visit before I head to Pueblo tomorrow for my second to last day of the Walkabout. I ended up shortening up my trip to get home and help Dear Hubby deal with the details of the hail damage which was pretty comprehensive. It would be overwhelming without me being gone…he’s suffering a bit of vapor lock on his own. It’s been a wonderful journey and I’ve met so many interesting people in addition to the wonderful friends and family that I am fortunate to know. It’s tempting to squeeze the entire drive home tomorrow, but it’s not going to happen. I’ll get to Pueblo for a good night’s sleep and head home on Sunday. It’s hard to believe that the Walkabout is almost over.